An indoor garden is as close as your windowsill, but many sills are too shallow to hold more than a few small pots. A windowsill extender gives you more plant-growing room so you can be more creative with your garden arrangement. Not all sill extenders, or windows, are created equal. So take the time to explore your options and your needs before settling on a design. Manufactured windowsill extenders come in a variety of standard lengths, widths and finishes that you can match to your home. They vary from permanent installations to temporary styles. If the idea of drilling holes in your windowsill or wall isn't appealing, then an extender designed with angled legs that rest against a wall to form a brace is a better option. A permanent extender requires the installation of brackets into the wall studs beneath the window. If an extender isn't permanently fastened to a wall or sill, then position your plants carefully so the extender doesn't become stressed near an edge and collapse. If pets or children are present and could pull down an extender, then a permanently installed extender is a safer option. If the window isn't a standard size, then a homemade windowsill extender may be your only choice. Create a custom-sized sill extension by cutting a laminate board to the sill's length and setting it on top the sill. Screwing metal shelf brackets into the laminate board and into the wall studs beneath the window makes a sturdy support, and the laminate board resists water damage. You can alter the design to fit your window, but the brackets must be secured well so the shelf doesn't collapse under the weight of plants. You can keep the project simple by placing a low shelf or bookcase in front of the window and using it as a windowsill extension. Choose a shelf or bookcase with a top the same height as the windowsill. Plant space can be added elsewhere, too. Glass plant shelves resting on brackets screwed into the window frame will extend your plant-growing space upward instead of outward, with the column of shelves along the length of the window; that arrangement maintains the window's original profile. Space the shelves so your plants have room to grow to their full sizes without touching the shelf above them. Extending your windowsill isn't always a good solution. 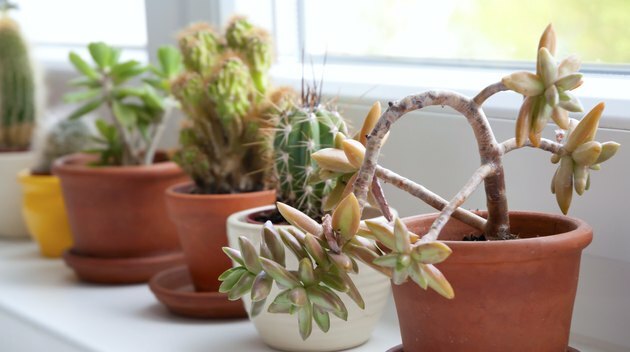 The University of Minnesota Extension cautions that windowsills are often one of the cold areas of a home, and that they may not receive adequate sunlight for healthy plant growth. Use a windowsill extension only if the window receives sufficient light for plants; usually a sufficient amount is available through an east- or a south-facing window. The window also should be well-sealed against wintertime drafts. Plant foliage shouldn't touch window glass. Water damage from the plants is also a concern. Drip trays beneath the plants' pots and a plastic mat over the top of the windowsill provide some protection from water, but clean and dry beneath the drip trays and plastic mat regularly. Should I Keep the Windows Open When Running a Cool Mist Humidifier?